Hey guys. I know it’s been awhile since I posted something here. That is because I have had a lot going on in my personal life. So, I thought it was time for a life update for you all. While I do not make any money from blogging (some bloggers do), I still love sharing tips and tricks with you all. I also like being able to give you small glimpses into my life offline. In today’s post, I am going to do a bit of the latter. I have some news to share, and I want to share my thoughts on the future of this blog. Don’t worry; I don’t plan to quit blogging anytime soon. I got a new, full time job! It took a few months of on and off job searching and about a dozen interviews, but I did it. At the beginning of this month, I accepted an offer to work as a teller for a local bank. It may not be a music or writing job, but I have been enjoying it so far, and I think it fits my strengths and skills. I have always been good at mental math, and I am also very meticulous and detail-oriented. I started last Monday, so I have officially completed a week of training, and I still have another week of training this week. These two weeks are at a different, busier branch than where I will be working. Then, next week, I get to go to the branch where I was hired. Now, some of you might be curious about the bank I work for. For privacy reasons, and to stay in compliance with the company social media policy, I will not be stating the name of my employer. *NOTE: The views and opinions in this post do not represent those of the bank for which I work. With my full time job, I do have less time to dedicate to blogging, so I think I will stick to one post per week. If I have time to write a second post, then I will. I definitely don’t want to limit myself to one post a week. However, I also need to have time to do other things, like cook myself some food and practice flute, and just be a twenty-something. Another change I am considering is adding some posts here and there that relate to my new found career path. I am thinking about writing posts on applying for jobs (part time and full time), the interview process, and then maybe a few posts about the basics of my job. Since blogging is not my job, I don’t feel bound to stick to one niche or subject. I have the freedom to write about what I choose. Blogging is something I do for fun, one day it might be for profit, but that is not the case right now. I also want to use that freedom of a personal blog to appeal to a wider audience. You may not be interested in everything I post, but I want to have a little something for everyone. That’s what blogging should be about, right? I am still playing in a local flute choir, and I take private lessons when I can. Music is what I studied in college, and I want to maintain the skills I achieved. Flute and piccolo will always be a part of my life; I have no doubts about that. Since I do have a job in another field (which I love), music has taken a slight back seat. I can’t get in much practice except for evenings and weekends. I think that has been hard. As a music major, the bulk of my day was spent practicing alone or with others. That is not the case anymore. Music is still a huge passion of mine, and I want to keep that passion alive as best as I can. This may or may not interest you, but since I have been out of the dorms, I have slowly changed my eating habits. In college, I was subject to what food was in the caf. If I didn’t find anything, I would have to order in or eat from the vending machines. Now that I am back at home and have access to a kitchen, I have become more mindful of what I am eating. I meal prep my lunches for the week. I try to find healthier alternatives for snacks. Small changes have made me want to make bigger changes. I have also started to limit my consumption of animal products. I already don’t eat any red meat or fish. Milk products and eggs don’t really appeal to me on their own. When I do consume animal products, I try to be more mindful of what I am putting into my body. I know this post is a bit out of the ordinary. I normally write more informative content. 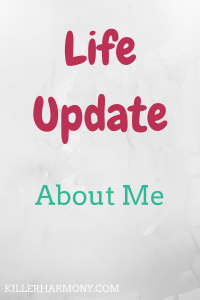 But, I wanted to share a life update with what has been happening and why there was no new post last week. With these changes, I will be blogging a little less frequently. For more regular updates and content, follow me on my other social media accounts. No matter what instrument you play, you will probably have to play with others at some point. Multiple parts means there is a score available for the piece. So, I wanted to talk about score study. What is it? Should you study scores? Why do you need to know the other parts? Those are all good questions that I hope to answer in this post. The short answer: score study is very important for understanding a work in its entirety. In most cases, there is more to a piece than just the part you play. There will be other melodic lines and more accompaniment-based parts. 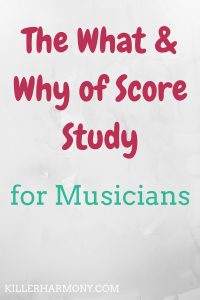 So, here are the ins and outs of score study and how to get started. Score study is something that all conductors and many advanced and professional musicians do with every piece they work on. Score study is exactly that: you study the entire score. Studying a score allows you to figure out what is going on in each part at each moment in a piece. It could be as simple as a solo or as complex as an orchestral tutti passage. Looking at the score and all its components can also tell you how and where you fit in. Are you the root of the chord? What kind of chord is it? How do your dynamics relate to other instruments? Those are all good questions that can be answered from looking at a score. Who Should Practice Score Study? If you are a musician who plays with others, and you are no longer a beginner player, you should practice score study. Once you know the fundamentals of how to play your instrument, you can start to learn how to play the music. Score study gives you more than just the notes and markings for your part. Knowing the relationship you have to other parts will allow you to make more informed choices regarding dynamics and articulation. If you are a more advanced or professional player, you should definitely work score study into your routine. Just a few minutes with a score can answer many questions you have about a piece you’re working on. What if I don’t own the score? For solos and chamber music, you can find the score or accompaniment part online. You can order it from many different online shops, or you can look for it on IMSLP. If you want to see the score for a large ensemble, check IMSLP or ask your director if you can borrow a copy. If that doesn’t work, you can then make a list of questions to ask the director next time you meet with them. However, you should own both the solo part and the accompaniment to any solo repertoire that you are working on. Yes so you can use it for score study, but also so that you can provide a copy of the music to an accompanist if needed. Another option if you really can’t get your own copy is to check with a local library or interlibrary loan program to see if you can borrow a copy. That way, you can make marks in your part so that you can be better prepared for a performance. The first time I had to actually study a score was for music history. Each semester, we were assigned a work from the standard orchestral repertoire to analyze. I had to find the main themes, any changes in key or tempo, and other big parts of the score. Then I had score study assignments again during my conducting class. As a conductor, you need to know what is going on in each part through the whole piece. So conducting really made me aware of more than just my part. If you are feeling intimidated, start small. Take a look at a duet, either from your teacher or your own collection. How do the two parts relate? What is each part doing? Where is the melody? Ask yourself those questions and the other questions scattered throughout this post. They will help get you started. An example of how score study helped me perform a piece happened last year. I was set to play Mozart’s Andante in C for flute as part of a recital. The piece has piano accompaniment, and the piano part helped me understand how the flute line works. There is a section in the middle where the piece changes key, but that is not obvious in the flute part alone. So taking a look at the entire score showed me that it does change. Instead of trying to make it sound major, I was able to make a better choice to give a more solemn tone to that phrase. Score study may sound intimidating, but it can open your eyes to a whole side of music making. You can actually see what is going on in other parts. It’s pretty cool when you think about it. Have you done score study before? How has it helped? Let me know in the comments, and be sure to follow me on Instagram (@killerharmony) subscribe below for exclusive music tips sent straight to your inbox! Subscribe to join the Killer Email Squad! 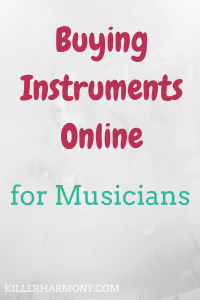 With websites like Amazon and eBay, it is easier than ever to buy instruments online. You can find so many amazing deals, and you can have your new instrument in a matter of days. Gone are the days of having to trek to a music festival or visit an instrument vendor or store. You can order yourself a new instrument from your own bed. How nice is that? It’s nice…if you’re smart about it. There are some good deals out there, but there are also some not so good deals. So, I am going to give you my tips for buying instruments online. While in person is best, sometimes you have no other choice. 1. Stick with reputable brands. There are dozens of brands of instruments on sites like Amazon, but a lot of them are of bad quality. They are cheaply made instruments, which is why those instruments are usually really cheap. If you are searching for a flute or piccolo, stick to brands like Yamaha, Pearl, or Jupiter, among others. These instruments will cost more than the “Sky” or “Band Director Approved” instruments. Going with a reputable brand means you will get a better quality instrument. It will last longer, and the cost will be worth it over time. Please do not buy those $100 instruments; they are not worth your time or money. Read the reviews of the instrument before you purchase. If you can, contact someone you know who has played the brand and model you are considering. Or ask a private teacher for recommendations. In many cases, the reviews can tell you a lot about the instrument. If you cannot test the instrument out before buying, you want to make sure you are getting a good value. If you are on Amazon, you can even check out the Q&A section to see if there are any questions with helpful answers. Reviews may seem silly, and of course you should ignore the more biased ones. Some reviews can be really helpful, though. 3. Look at specialty websites. There are so many online music stores, both general and instrument specific. Even if you plan to buy from Amazon, check with these other sites to see if the instrument you want is available. For flutists, websites like FluteWorld and the Flute Center of New York have a ton of good brands in stock. I ended up purchasing a piccolo from Amazon, but I had seen it on flute specific websites. I also had a recommendation from a flute teacher. These specialty sites will probably have a higher shipping fee, but a lot of them do have trial periods. If you decide you don’t like what you ordered, you can send it back. That is a great perk when you are unsure of what you want. 4. Check the shipping terms. And track your package. What I mean by this is that you should be aware of how your instrument will be shipped. I personally would go for the fastest shipping you can. Yes, it adds to the cost. But the last thing you want is to have your instrument sitting in a warehouse without temperature controls. You should also do your best to be home the day your instrument arrives. That might contradict my last piece of advice, but it’s almost more important. So priority goes to being home on delivery day. If you are out running errands or working all day, you won’t be able to get your instrument inside and away from crooks. Not only do you want to get your instrument out of the elements quickly, but you don’t want to have a package sitting on your doorstep that will attract thieves. 5. Know the return policy. This goes for anything you buy online. If you buy from somewhere that does not have a trial period, you still should know whether you can return the instrument if you are unhappy. How long do you have to make a return? Do you have to pay for shipping? How do you ship it back? While you will hopefully find something you love, you still want to be aware of the terms in case you don’t end up liking the instrument or in case something is wrong with it. 6. Buy in person when you can. 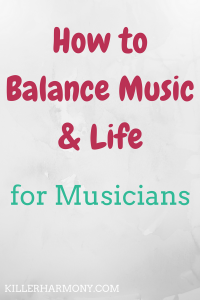 I wrote this post for the people who can’t buy an instrument in person. If you have the option to buy an instrument that you want in person, do that. You’ll save on shipping, and you can test the instrument out before you even purchase it. For when you can’t buy an instrument in person, I hope these tips help for buying an instrument online. Definitely read up on everything you can regarding the instrument you want to purchase and educate yourself and the shipping and return policies. 7. Enjoy your new instrument! Buying a new instrument is exciting! So be sure to enjoy your new purchase. While some purchase methods are easier or harder, no matter how you buy, have fun. Have you bought an instrument online before? What was your experience like? Let me know in the comments, and be sure to subscribe for more exclusive tips and musings sent straight to your inbox!